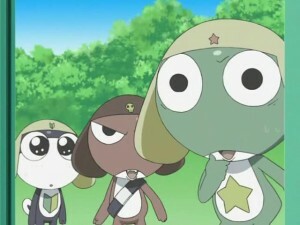 Keroro wants Saburo’s Reality Pen for his new invasion plan, but since the pen only works for Saburo, he goes to see Kururu about getting another one. 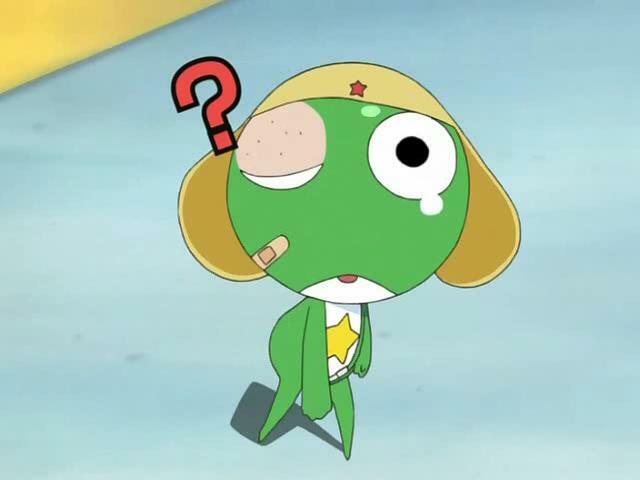 Unfortunately, making a new one is basically impossible, but since there is a lost one from when Kururu came to Earth, Keroro decides to try to find it. After having Mois knock out Kururu, Dororo is sent into Kururu’s mind, but it soon becomes apparent that Kururu has thwarted him. After Giroro and Tamama are sent in and failed, Mois sends the reluctant Keroro in, where he soon finds Giroro and Tamama, both having experienced some of Kururu’s memories. 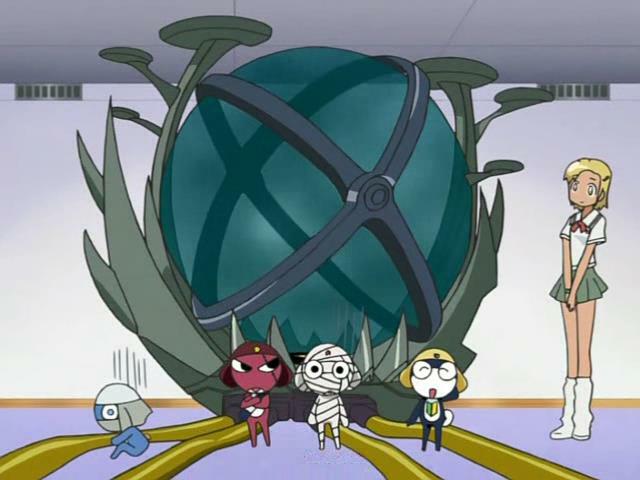 Finding a memory with a warning on it, Tamama suspects it is actually safe, so the three enter where they discover Kururu’s memory of meeting Saburo. Kururu is surprised when Saburo sees through his anti-barrier, and further surprised when Saburo manages to steal one of his reality pens. 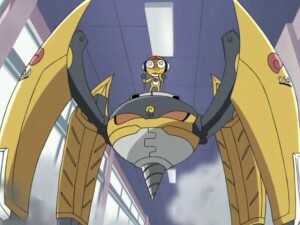 Kururu is impressed, but has to get serious and sketch a 4-legged mecha to try to catch Saburo. 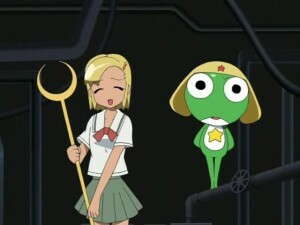 Keroro and Giroro remember this day well as they witness themselves at various points. 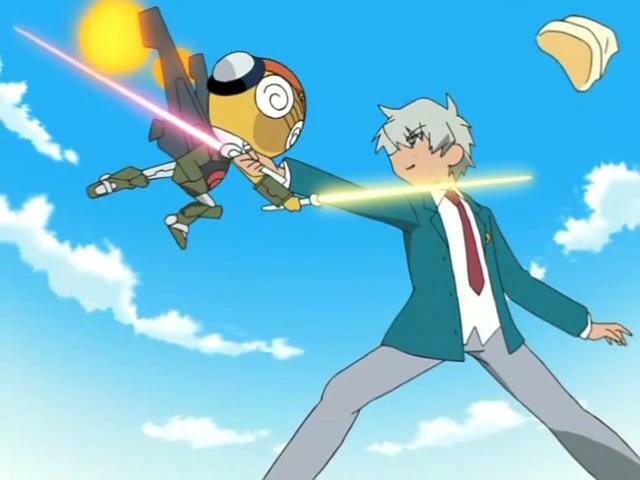 Saburo and Kururu show up and the battle of pens is on. However, while Kururu disarms Saburo, the carnivorous plant he draws up ends up disarming him. Subaru escapes the plant, grabs his pen, draws a canister, and burns the plant. 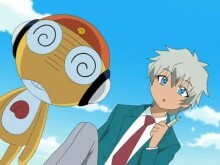 Kururu gives him the pen as a reward. 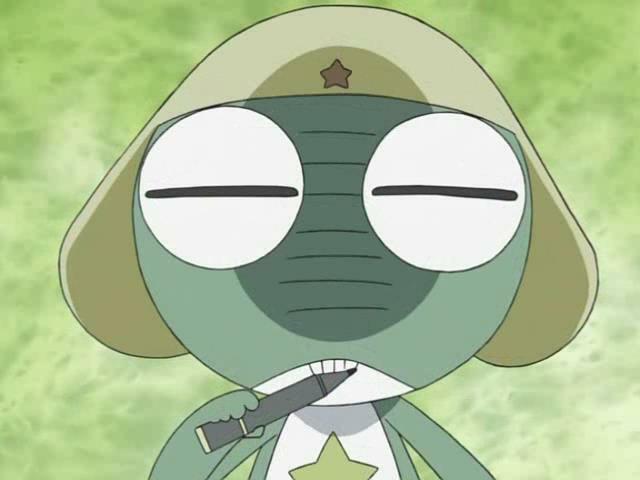 Meanwhile, Keroro finds the other pen, but it is destroyed when Tamama from that time goes off on a mosquito. After the foursome leave Kururu’s mind, Kururu warns Saburo that Keroro will likely come for him to draw a new pen. For this episode, we have a single story rather than the usual two story episode. This episode referenced events from episode 2, so I gave that a quick gander. The character designs for Keroro are much different, reflecting the early manga designs. 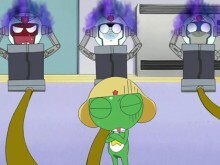 However, it appears that at least some animation was reused from that episode until Keroro left the gym, after which the animation was new. 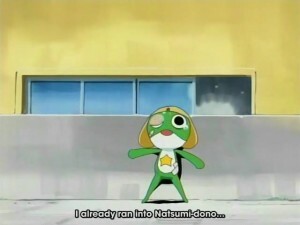 All of the stuff with Keroro encountering Kururu without realizing it was all retconned in. It would have been nice if there had been little foreshadowing moments back in episode 2, but that didn’t happen, thus the retconning. It has been a very long time since I read the original manga (whatever TokyoPop released since this series never got scanlated, meaning I haven’t read beyond TokyoPop’s failure), but I think this story was in the manga. Maybe one day, I’ll reread the manga and see (Gundam references and all). I find it humorous in a way that the manga is still ongoing and a new anime series (howbeit in Flash animation) is coming out Spring 2014, but the series is pretty much dead in the U.S., even among the fan community. Oh well. 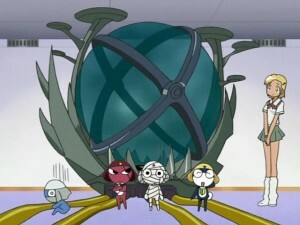 In the end, this was an OK episode, but nothing special.